1. Put the tahini, yogurt, lemon juice, cumin, garlic and salt in a small food processor and whizz to a thick paste. Scrape down the sides, add 4 tbsp water and whizz again to a creamy sauce. Add a splash more water if necessary. 2. Heat a griddle pan over a high heat. 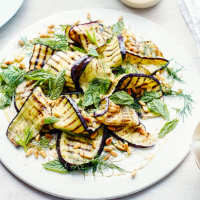 Brush the aubergine slices on both sides with oil, then season and griddle in batches for 2-3 minutes on each side, until soft and charred. Arrange on a large serving plate and squeeze over a little more lemon juice; set aside to cool. This recipe was first published in August 2016.